Dane Tingleff submitted this photo and caption. 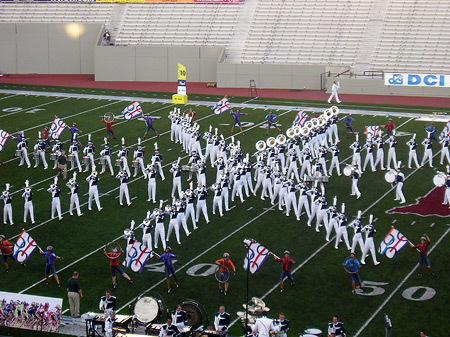 I've only recently become very taken by drum corps shows, though I've been a musician throughout middle and high school. I have played mostly saxophone, but took up trumpet just so that I can audition to become a member of a drum corps. I'd never actually been to a drum corps performance (not counting high school marching band, of course, of which I've been a dedicated member). This past summer I flew to Indiana from my home in California to see the DCI World Championship, and I thoroughly enjoyed it. This photo of the Blue Stars is one of many that I took that day.